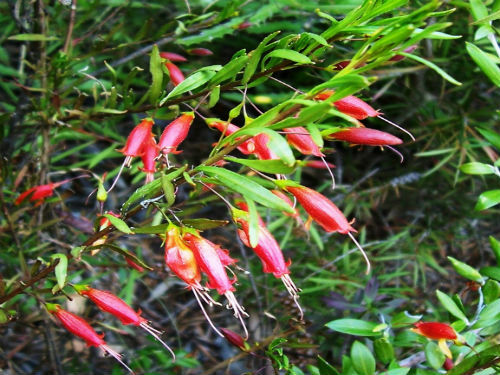 Eremophila decipiens, Slender Emu Bush is a small shrub that reaches a height of one metre. Bright green leaves are flat, sticky and vary in length with a pointed tip. Flowers are typically tubular with four upper lobes and one lower. Blooms are bright red, profuse and appear from April to November. Sporadic flowers appear at other times. Honeyeaters enjoy visiting the flowers. As with many emu bushes flowers are held on s-shaped pedicels (stalks). Tip prune occasionally to keep plants dense and bushy. Slender Emu Bush could be grown as a foreground shrub in native garden beds or as a container plant. E. decipiens is found in central and southern Western Australia and southern South Australia. The species was named in 1921 from material collected near Kalgoorlie, Western Australia. The species name means deceiving or false. This may refer the species similarity to some forms of E. glabra.